Introducing the first fiber-optic intubating laryngoscope set designed specifically for use within the magnetic resonance (MR) environment. For Use in Field Strengths up to 3.0 Telsla - Tested to comply with ASTM Standards for "MR Conditional" devices in up to a 3.0 Tesla environments. 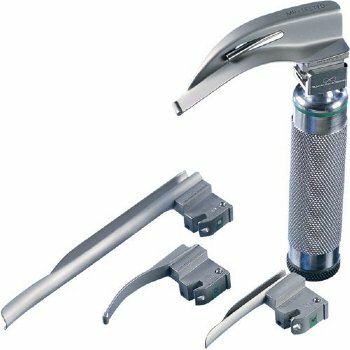 Long Life - Laryngoscope handle developed from selected low-magnetic materials. Proprietary low-magnetic signature lithium battery delivers 4 times the useful life of a standard alkaline battery. High Intensity - A 3.5V halogen lamp yields a high-intensity, fiber-optic delivered light beam. Pediatric Handle-4.5" in length and 1" wide. This smaller handle makes certain situations and angles easier to manage.